Be the first to share your favorite memory, photo or story of Saundra. This memorial page is dedicated for family, friends and future generations to celebrate the life of their loved one. 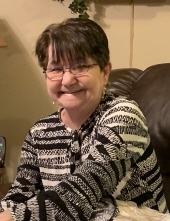 Saundra “Kaye” Stratton, 58 of Prestonsburg, KY, passed away February 10, 2019 at her residence. Born March 5, 1960 in Floyd Co. KY, she was the daughter of the late Danzel Lee & Estill Jean Jarrell Endicott. Kaye is survived by her Husband, Fredie Stratton of Prestonsburg, KY. She was a homemaker and a member of the Cow Creek Freewill Baptist Church, Prestonsburg, KY. Kaye is survived by her children: Timothy (Elizabeth) Stratton of Prestonsburg, KY, Estill Lee (Julie) Stratton of Churubusco, IN and Maranda (Paul) Goble of Prestonsburg, KY; two sisters: Bella Jean Wilson and Patricia Jo “PJ” (Terry) Woods both of Prestonsburg, KY; grandchildren: Shayla Stratton, Hannah Stratton, Isaac Goble, Derek Stratton, Emily Stratton, Kaylee Goble, Lindsey “Lou Lou” Stratton, Tyler Stratton & Kara Holbrook; great grandchildren: JJ Lewellyn & one on the way: Julian Lewellyn. She was preceded in death by two brothers: Danzel Jr. Endicott & Danny L. Endicott. Kaye will be missed by all that knew and loved her. "Email Address" would like to share the life celebration of Saundra Kaye Stratton. Click on the "link" to go to share a favorite memory or leave a condolence message for the family.